Cholera Cases Spur Containment Efforts In Haiti The threat of Hurricane Tomas has passed, but Haiti is facing a cholera outbreak. Amid fears that the deadly waterborne disease could spread quickly in the crowded camps for earthquake survivors, aid agencies and the government are working to contain it. Health officials in Haiti are investigating more than 100 suspected cases of cholera in Port-au-Prince. There's great fear that the deadly waterborne disease could spread rapidly in the crowded camps for quake survivors across the capital, so aid agencies and the government are scrambling to try to contain it. Cholera has now been confirmed in half of Haiti's 10 provinces. According to the Ministry of Health, the outbreak has killed more than 500 people and sickened at least 8,000 nationwide. Health officials with the aid agencies say they worry that the heavy rains and flooding from Hurricane Tomas last week pushed cholera-contaminated water into more parts of the country. Officials have yet to officially declare the cases in Port-au-Prince as cholera, but dozens of people there have come down with cholera-like symptoms. In the Old Military Airport camp in the capital, a Red Cross worker with a megaphone marched through the shacks recently, announcing that cholera had arrived and warning people to wash their hands, sterilize vegetables and clear garbage from around their shacks. The camp houses some 50,000 people packed onto an abandoned airfield. Aid groups including Doctors Without Borders, the British Red Cross and Partners in Health are building a special cholera treatment unit at the camp. Despite the fact that it is not yet fully operational, patients are arriving with severe diarrhea. People who enter have to dip their shoes in trays of chlorinated water, and men in surgical masks spray the area with what look like fumigators. "As you can see, we make the decontaminations with chlorinated water," says Dr. Anany Prospero with Partners in Health. He says this unit will be used to assess possible cholera cases, provide initial treatment and refer the more serious cases to a local hospital. It will operate 24 hours a day. Prospero says camp residents are being urged to come to the facility immediately if they have severe diarrhea or vomiting. Those who don't receive appropriate health care "can die in four to six hours," he says. They've already had a half-dozen suspected cholera cases here; it could take a few days for lab tests to confirm them. Most people in the Old Military Airport camp live in shelters cobbled together out of corrugated metal, sticks and tarps. Other people live in tents. For the 50,000 residents, there are only 178 latrines. Jean Charles Micheline, sitting in front of the shack she shares with her husband and three children, says she is terrified of cholera. "I'm very worried about it," the 27-year-old says in Creole. "It's said that it's contagious, and I'm worried that I may catch cholera." She says she heard about someone who got it just this morning in the market. Micheline shares the same fear as public health officials -- that in the chaotic camps around Port-au-Prince, where more than 1 million people are living in makeshift shelters, cholera could explode like wildfire. This is a worst-case scenario, Micheline says. 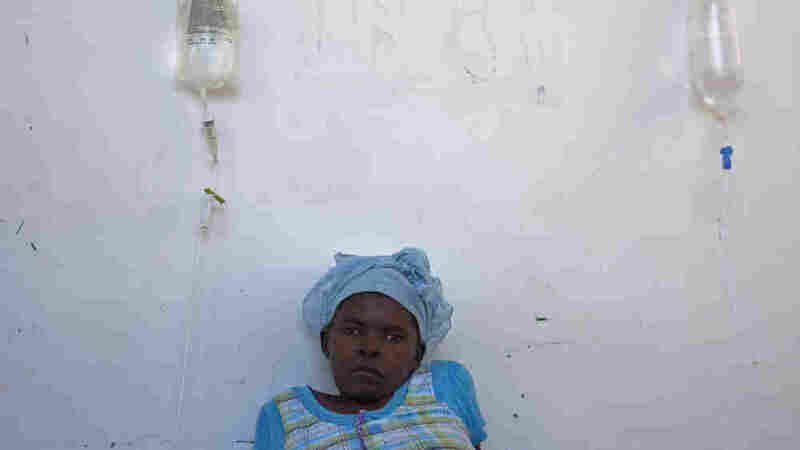 They're already living with so many problems, she says -- in these conditions, the cholera is just going to multiply.